A basic planning assumption needs to be that monitoring will help identify areas of opportunities and issues that can be analyzed and utilized to better accomplish established goals, or adjust goals that are not realistic. Livestock grazing management plans for a ranch or property should be developed for each individual pasture or management unit so that unique issues and opportunities are addressed. For example, one pasture may have vernal pools and sensitive aquatic wildlife while another pasture may have oak woodlands and native perennial grasses. Determine the existing condition: inventory of facilities,issues and opportunities. Determine the desired condition: establish goals and objectives for each pasture and the ranch as a whole. Analyze predicted impacts, develop measurable goals and select a strategy for achieving your goals. Monitor indicators to evaluate progress towards achieving your goals. Once the grazing management plan is implemented, these steps should be repeated continuously. Monitoring is used to reassess the pasture's condition and progress toward goals, which in turn will show if the selected strategy is still appropriate. In other words, monitoring helps identify issues and opportunities that can be analyzed and then used either to adjust the strategy for reaching the goals or to change goals that are not realistic. Step 1: Determine the existing condition: inventory of facilities, issues and opportunities. The extent of this step will depend on the information that is already available and the potential issues associated with the property. When possible, the inventory of issues and opportunities should rely on information that is already available. However, when historic information is unavailable or is not reliable, new field surveys and public involvement meetings may be needed. Additional surveys should be relevant to the issues identified and the decisions to be made. For example, detailed soil surveys would be appropriate if restoration seeding is anticipated, soil surveys would not be needed if seeding is not anticipated. If good livestock actual use records are available, there is no need to prepare a detailed carrying capacity analysis. Only collect information that is needed to address your issues. Estimating the amount of forage available, which can be based either on historical livestock use records or calculated by determining the average forage produced and the area utilized by livestock. Average forage production is often reported in the USDA soil survey. Determining the condition or health of the rangeland, methods such as those presented in "Interpreting indicators of rangeland health." ITR 1734-6 can be used. Mapping existing livestock facilities such as water sources, fence locations and access roads. Holechek, J. L., R. D. Pieper, and C. H. Herbel. 2000. Range management: principles, and practices. 4th ed. Prentice-Hall Inc., Englewood, NJ. U.S. Department of Agriculture, Forest Service. 1997. 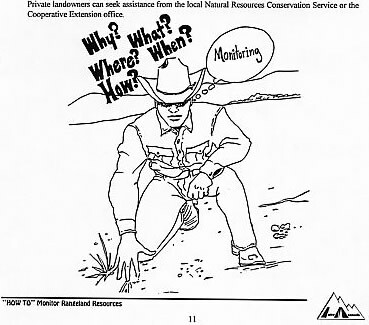 Pacific Southwest Region Rangeland Analysis and Planning Guide. R5-EM-TP-004. Step 2: Determine the desired condition: establish goals and objectives for each pasture and the ranch as a whole. Clear, concise goals and objectives must be developed before selecting a management strategy for a property's rangeland resources. For planning purposes, goals are typically general while objectives are typically specific and measurable. 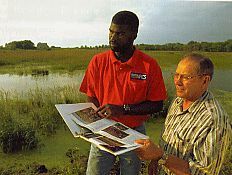 Examples of goals include "improve forage production", "make a profit", and "protect endangered species habitat", and examples of objectives for a specific site may include "retain 1,000 lbs/acre of RDM", "develop 5 water sources", "establish riparian stream cover of 80%" and "maintain 50% cover of perennial grasses". In addition, objectives should include a timeline, as some can be accomplished in 1-2 years while others may take 10-20 years to accomplish. Because goals and objectives are seldom of equal importance, it is best to prioritize or group them as essential, important and desirable. For example, a goal statement could be worded: "The goals for the property are to increase A, B and C; to maintain D and E; and to avoid conflicts or problems associated with F, G and H". opportunities for potential lessees to complement their existing grazing operations, which are often overlooked by agencies. The goals do not need to be elaborate or extensive, just appropriate for the property or individual pasture. Savory, Allan. 1999. Holistic management, a new framework for decision making. Island Press, Washington D.C.
U.S. Department of Agriculture, Natural Resources Conservation Service. 1997. National range and pasture handbook. 190-VI. U.S. Department of Agriculture, Wsshington DC. Each component includes practices that are measurable and can affect individual indicators in various ways, sometimes positive and sometimes negative. To help rangeland managers analyze the impacts of livestock grazing, this web site summarizes numerous environmental and economic indicators. Each summary predicts how the indicator will be affected by the first three components of a grazing plan. While grazing plans also need to include frequency of use, this fourth component is not evaluated as not enough is known to reliably predict the impact of the rest interval between use periods. Analyzing the grazing impacts and selecting the best management practices can be relatively simple if there are only one or two goals. However, the process is generally more complex. There are often numerous goals and these can conflict with each other, which means there is seldom an ideal combination of practices that achieves all of the goals and objectives. For instance, livestock management practices that achieve short- term goals can conflict with those that achieve long-term goals (see example below). In addition, there may be more than one combination of practices that achieves all of the essential goals. A good approach is to ask first if all the essential objectives are being met and then how well the other desired objectives are being met. Example of conflicting goals: A pasture could have the goals of reducing yellow star thistle, a noxious weed, and protecting riparian hardwood vegetation. Grazing livestock between late May and early July would help reduce yellow- star thistle but could adversely affect the riparian hardwood vegetation. This may mean deciding which goal is more important. However, there may also be an opportunity to meet both goals: fencing could exclude livestock from the riparian area while allowing them to graze the yellow star thistle. Every livestock grazing management plan should include a well-defined monitoring plan. Monitoring will provide the information to determine if desired goals are being met, or if some management practices need to be modified. Monitoring plans need to be realistic and achievable. A common mistake is to develop a monitoring plan that is so elaborate and detailed that it is impossible to implement fully. When only part of a monitoring plan gets done, information that could be the most useful may not be gathered. For more information, see the monitoring section.